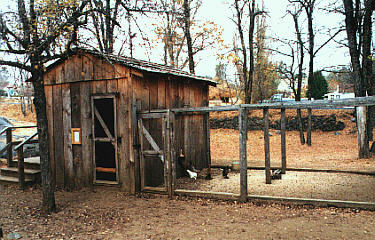 You may think that building a chicken coop is a simple matter. You may believe that such a project would be completed in a short time with a minimum of bureaucratic vagaries. You may imagine that the local community would have little interest in such matters. If you do think these thoughts, you may never have visited Columbia SHP. In early 1989, Museum Technician Diana Newington suggested to her supervisors that we build a new coop for the park chickens. Their first response was not encouraging. They laughed. She then attempted to make her supervisors more aware of the historic significance of fowl by producing a report titled "The History of Chickens in Columbia". 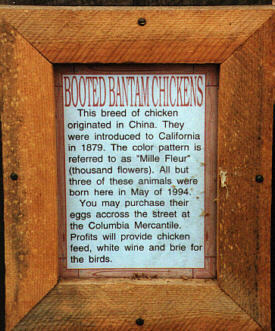 The report showed how chickens are a part of the cultural fabric at Columbia. They were used for eggs, meat, barter and pillow feathers. Early diaries from Columbia are filled with references to chicken abodes. Our archives are imbued with information concerning egg prices, fowl breeding techniques, feeding information and citizen complaints of unruly birds. By not properly interpreting the significance of chickens in the everyday life of a gold rush town, we were missing a tremendously important interpretive opportunity. We were also incurring the wrath of numerous local citizens and concessionaires. They loudly protested that we were not properly caring for our animals and that we were endangering artifacts by letting the chickens foul the antiques stored in what was then the chickens home and farm implement shed. Her bosses became believers. They enthusiastically said "O.K., but you do the paperwork." That is when the real work, and frustration began. A four year trek through the hinterlands of the state bureaucracy led Diana to resource management personnel and a California Environmental Quality Act report. The next stop along the paper highway was for handicapped access to the coop. Then on to the department's archaeologists for their approval. Tiring but not surrendering she hurdled the obstacle of receiving approval from regional historians when the region no longer existed and the historian was working for CalTrans. Finally, Director Murphy gave his approval to the project. All we had to do then was build it! Some local citizens and concessionaires were not completely satisfied with the project. They felt that the "Taj Mahal" of the bird world is too extravagant for state chickens. They seemed to overlook the incongruity of their comments when viewed against their recent condemnation of the state for not providing a coop! Even though the coop is made of surplus wood and was constructed with inmate labor, they still felt that the project was a waste of their hard earned tax dollars. More importantly, the school children visiting the coop disagree. They love it. The coop was a long time in coming. However, the benefit realized by interpreting the cultural fabric of chickens in the gold rush is well worth all the effort.